So, Bakersfield author and website editor, Nick Belardes, has a new book out called "Random Obsessions". He's in Fresno this weekend to hang with Kopi on Friday morning. Then Saturday to do a reading at the Met (11:30 AM) and a book signing at Barnes and Noble at 2:00. Add another Fresno related book to all the gifts you're getting your sixth or seventh favorite Fresno blogger this Christmas. The Underdogs to Wonderdogs book arrived in town yesterday, after having to pass through customs - seriously. 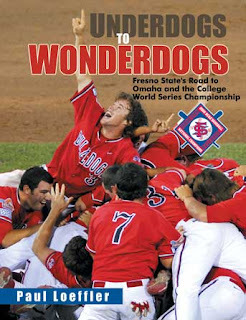 The book chronicles the crazyass road the Fresno State Diamond Dogs took to win the College World Series. I'm sure it's at the Bulldog Shop but you can go here too. Only seven more blogger shopping days left, ya know.